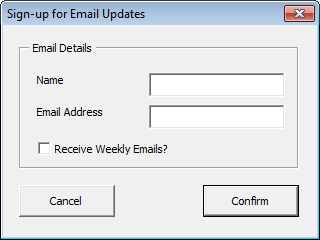 User forms are custom user interface screens that you can develop in VBA to interact with your users. An example user form is shown below. Learn how to use various form controls & user form features in this section. Form Controls are objects which you can place onto an Excel Worksheet or User Forms, which give you the functionality to interact with your data. You can use these controls to help select data. For example, drop-down boxes, list boxes, spinners, and scroll bars are useful for selecting items from a list. Option Buttons and Check Boxes allow selection of various options. Buttons allow execution of VBA code. You can place form controls on user forms (created from Visual Basic Editor) or inside Excel worksheets. By adding form controls to user forms, we can tell Excel how the value entered in that should be treated. This is done a special type of macros called as Events. By adding a control to a worksheet and linking it to a cell, you can return a numeric value for the current position of the control. You can use that numeric value in conjunction with the Offset, Index or other worksheet functions to return values from lists. You can use form controls in 2 contexts – (1) in User Forms (2) in regular Excel worksheets. To use form controls, this is the process we need to follow. Select the UserForm, you should see Toolbox with all userform controls. If the Toolbox is not displayed, you can enable if from View menu. Select any userform control and draw it on the userform. Design the form as per your desire. Tip: You can adjust properties of multiple controls by selecting them all and then making changes to their properties. See this short animated demo to understand how to create & design a UserForm. Different Form Controls & What they do? Scroll bar Allow Horizontal or Vertical scrolling Increases or decreases a value by a fixed amount. Can be linked to a cell. Spin Button Increment/decrement a value by a fixed amount Increases or decreases a value in steps by a fixed amount. Can be linked to a cell. For more information, read Form Controls & how to use them in the context of Excel. Events are a special type of Macros (VBA instructions) that run whenever user interacts with userform controls. For example, you can write an event to tell Excel what to do whenever user clicks on the submit button. Each userform controls supports various events. Active X controls are like Form Controls on Steroids in that they have a much wider range of properties than Form Controls. They also have much better ties to VBA in terms of programmability and have a number of events that can be accessed programmatically. The main limitation of Active X controls are that they use a Microsoft Active X component. This means that if you are sharing your workbook with an Apple Mac user using Excel for Mac these functions wont be available as Active X isn’t available on that Platform. Workbooks with Form Controls will happily work on a an Apple Mac. Using Form controls inside Excel is a great way to add interactivity to your workbooks. Below you can see one such example. We, at Chandoo.org have lots of examples & detailed tutorials on these. Please visit these pages for more information on this. Please check back again. We are adding new examples to this area. Please read thru these references to learn more about UserForms & Form Controls in Excel VBA.